My sister and I just crossed paths, like (air)ships in the night, at Johannesburg’s O. M. Tambo airport. At precisely the time my University College London colleague, Dr. Folashade Akinmolayan, and I were taking off from Tambo yesterday, my sister, Heather Massie, was boarding a plane in New York City. Heather was en route to the same airport. Although Heather and I didn’t physically meet at Tambo airport, we were together in spirit–united by common causes and with more than just our flight itineraries overlapping. Finding ourselves in southern Africa at the same time would seem to be chance, but it also reflects who we are as people. It reflects values—of science, of learning, and of equality among people—that our parents instilled in us from our earliest days. Heather and I learned well from our mom (Cynthia Mara) and dad (Don Massie), and the values they gave us shape how we see the world, and how and where we work today. Shannon with Cynthia and Heather one Christmas after Mom’s trip to Japan. Heather and I are both STEM (science, engineering, technology, and maths) educators, but of wildly different sorts. We both do outreach and community engagement activities with groups of diverse people and in under-served places. We both use “audience” participation to share our passions in STEM with others. We teach in spontaneous, improvisational, and highly interactive ways. We both see people as individuals and we bond quickly with others. We value our diverse friends, colleagues, and communities. We see diversity as an essential feature of creativity and we view it holistically—believing that identity is dynamic and ever-evolving and that people work everyday to develop their own identities with regard to gender, race, ethnicity and nationality, belief system, physical ability, sexual orientation and the intersection of all these and more. As a result, Heather will be in Zimbabwe and South Africa for the next five weeks, performing her critically acclaimed one-woman play about Heady Lamar. Lamar was a Hollywood screen star, an impassioned inventor, and a self-educated engineer. She developed technology that makes all our wifi and bluetooth devices work! Similar to Heather, I was in Johannesburg this past week, facilitating a workshop for 26 engineering educators from all over South Africa. Via this workshop, Dr. Folashade “Shade” Akinmolayan and I shared what we have learned and implemented in practice. We shared what we know from our research on group-based learning and from what we have lived, by assigning team projects to students at University College London (UK), Dublin Institute of Technology (Ireland), and Hampton University (USA). Shade and I were invited to teach this Master class (one of eight multi-day seminars on teaching and learning coordinated by South African engineering educators) because we are both part of UCL’s Centre for Engineering Education. Shade is a chemical engineer with a doctorate in engineering and a focus on team-based learning. She coordinates group- and problem-based learning for the Chemical Engineering Department at UCL, though she will soon move to a new university where she will contribute to the development of an innovative new curriculum in chemical engineering–from the ground up. As for me, I’m an architecture professor from the USA who uses group-based approached to teach students in architecture, engineering, and education. I’ve taught workshops on such topics to other higher ed teachers at DIT, Hampton U, and William and Mary. Shade and I found the 26 South African participants in our two-day workshop on facilitating teamwork in engineering education to be extremely energetic and engaged. They were passionate about teaching. They were enthusiastic about learning, sharing ideas, and creating new knowledge. We discussed ways to address the specific challenges they face and strategies to help support the range of diverse students in their classrooms. Drawing from experience teaching in many different places really helped. All 26 participants were eager to discuss techniques, goals, and challenges surrounding their own efforts to facilitate learning in teams. Shade and I made a pretty dynamic duo, if I do say so myself. We really worked well together and delivered a workshop of top quality. We will look for opportunities to offer this workshop again. Please let us know if you have ideas for future venues–for our team building workshop, or for Heather’s play. Although Shade and I had literally just met—finding each other at the airport as we departed London for Johannesburg—we made great use of the day we had before the workshop to refine our plans, get to know each other, and learn to work together. The workshop went off without a hitch, and the learning the 28 of us achieved was highly impressive. As Shade remarked, the event was a great confidence booster for us as workshop facilitators. It was, in my view, a confidence booster for all 28 of us (participants and facilitators) because we are all engineering educators trying to innovate our teaching practices so that students learn more and develop a wider range of skills crucial for engineers to have, and we all walked away with stronger and more robust strategies. I wish to express my heart-felt gratitude to all the organisers and funding partners for the invitation and funding to participate in the Master Class programme of 24 – 25 April 2018. It highlighted, in a detailed and understandable manner effective teamwork fundamentals, strategies and ethics. The facilitators showed quality planning, timeliness and precision in delivery and coordination that motivated active participation: leading to a hugely successful programme. While looking forward to participate in future programmes, kindly please accept my respect and regards. This wasn’t the first trip to South Africa for Heather or me, although it was Shade’s first time going there (she’s a British citizen, born and raised in London). I was in Jo’burg and Cape Town in 2004, when Professor Brad Grant and I brought a group of Hampton University students there to study urban design. Wee looked at how urban design has been used to enforce racial and ethnic segregation. We also studied how contemporary architects and designers are working to counteract the adverse effects of decades of segregation and strife. I produced a booklet about the HU trip to South Africa. I can’t get the blog platform to upload the document for you, but please just email me to get a PDF copy. My email address is: irelandbychance [at] gmail [dot] com. As of this past Wednesday, the only definite dates with set show times were the Harare ones, but she will probably be performing on all of the listed dates. Please check Heather’s website for specific show times. I hope to share images from our tour of Johannesburg in a future post. I’m excited to welcome new visitors from Africa. I’m happy to report that people from three different countries in Africa have found their way to this blog in the past few days. 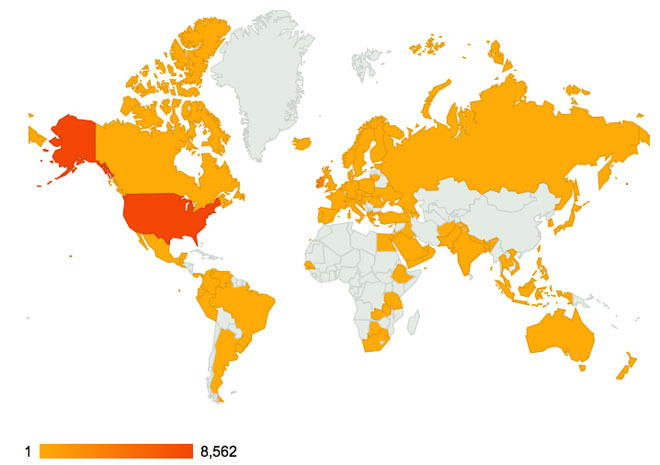 It appears that some places in the world are more difficult to reach via blog than others: the region around China, the Sahara, and Greenland are still missing from my map. Perhaps that says something about the distribution of population (Greenland and parts of Africa), resources and Internet access (parts of Africa and China), and restricted freedom of information (China)? In any case, I’ve enjoyed sharing ideas with my African friends ever since my first visit to Tanzania (in 2003). Since then I’ve returned to Tanzania and visited South Africa and Tunisia (all with students) as well. 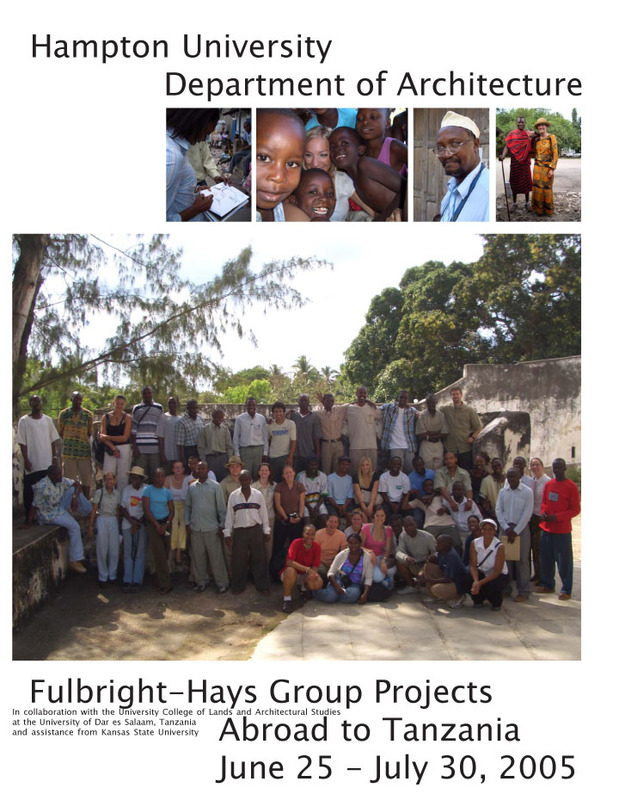 A highlight of my life experience has been the Fulbright program I conducted in Tanzania in 2005, though I am still working to make sense of many things I saw and experienced. This is a flier for the Fulbright-Hays program I conducted on behalf of Hampton University and the US Department of Education. (I wrote a grant proposal that was accepted, and I served as Principle Investigator of the grant and also as director of the program.) In the group photo, I’m standing second from the right. Many people in this photo are my friends on Facebook still today.